Need advice about a specific Chrysler Town & Country problem? Chart based on 52 repairs. 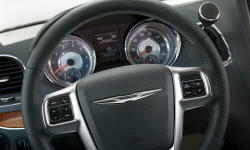 See TSBs and recalls for the 2013 Chrysler Town & Country. See repairs for all Chrysler Town & Country model years. 2013 Chrysler Town & Country 4dr Minivan, ext. 87000 mi Left turn signal was not coming on resulting in EVIC warnings and turn signal flashing rapidly. Replacing the bulb did not work. I removed tape from the electrical harness for the bulb socket, removed the harness and reinstalled it. Problem solved, must have been a loose or bad connection. 29140 mi Check Engine Light was on. Code P0520 - Oil Pressure Sensor Switch replaced under warranty. TSB 18-034-14 applies. US $139 A/C not cooling. US $100 Rear evaporator, AC expansion valve, Receiver dryer/accumulator, system recharged. US $106 Transmission was replaced. 75000 mi Complete transmission rebuild. Had new torque converter. Clutch plates burned out. US $10 Gas cap gasket failed causing check engine light. Replaced gas cap. US $76 ABS/Traction control warning lights on dash. Dealer found cut wire on left rear ABS wheel speed sensor. Cause unknown. Wire patched/fixed by dealer. 30500 mi Creaking noise when turning the steering wheel. Replaced front struts, mounts, isolator springs and absorbers. Front windows make a grinding noise when going up and down. Replaced window regulators and window motors on passenger and driver doors. 37000 mi Rear lift gate supports are not lifting the door all the way which causes the close button to not work and the lift gate to be low. Brake fluid low causing the BRAKE light to come on while driving. No leak detected. Fluid topped off. US $15 Drivers side windshield washer spray nozzle cracked off just above elbow under the hood which caused it to no longer spray on the windshield. Ordered replacement part 5116079AA for $14.86 and replaced myself. US $52 Passenger side door pillar cover broke off the vehicle while driving down the interstate. Replacement part 5020664AC ordered. Replacement only took a few minutes. US $600 Drivers side front caliper was leaking brake fluid. Both calipers should be replaced at the same time. While the calipers were off I replaced brake pads, rotors, brake lines and flushed brake fluid. Rotors still had plenty of life left, but it was easier to get it all done at once since the system was already taken apart. A family friend mechanic did the work. Total brake job cost $900. Calipers were probably about $500-600 of that. US $935 Vehicle had a severe rattle from the front left wheel. Dealership found that the tie rod ends were in need of replacement. This was not causing the rattle, but tie rod ends attach to the rack and pinion steering and are important to have in working order for a safe vehicle so they were replaced. Alignment is needed after replacing tie rod ends. Vehicle had a severe rattle from the front left wheel. The problem was found to be a problem with the strut. The strut was replaced and the noise went away. Parts required were 68156980AC strut, 6508274AA hex nut, 4721547AC strut mount, 4721602AB strut mount bearing, 4721581AA isolator spring, 68210979AA isolator spring. Labor cost was waived by service manager. C $187 Evaporate leak. Check engine light stayed on till gas cap repair. C $306 Replaced engine light sensor. 6000 mi #2 Repair passenger front seat passenger side. Said to be a broken "clip" Part ordered and installed week or so later under warranty. US $400 Center air vents become closed when fan is on full speed. Air vents were replaced, and problem solved. However, drivers side air vent developed same problem a week after the repair. Have not gone back but apparently a manufacturing defect. US $35 Defective oil pressure sensor. Dealer offered to replace for $330; I purchased part locally for $35 and used instructions on Youtube to effect repair. 82000 mi Check engine light revealed code P06DD "Engine Oil pressure control circuit performance/stuck off," right after oil change/filter had been done. Apparently common after filter changes. Cleared code with code reader and it hasn't returned. US $400 Then the drivers side power mirror stopped working. Return trip is scheduled. Power lock actuator on driver's door stopped working. Unit was replaced. 94000 mi power drivers mirror not working. This was caused by an incomplete repair on the drivers door power lock -- they forgot to plug the mirror back in, and I needed to bring the car back for another day. 101000 mi Check engine light for oil pressure sensor. Cleared code after verifying that oil pressure was reading correctly. This sensor reading always happens a day or two after changing the oil. 109000 mi Check engine light came on. I keep a scanner nearby for this car, and it indicated a failed oil pressure sensor -- the same warning it gives every year or two. Erased the code. The car does provide reliable oil pressure information in the instrument panel, but I get the same warning every 18 months or so, which I subsequently erase. 96000 mi Engine would just stall at low speed or stopped. Sometimes would also not start. They never found what the problem was other than there was a faulty code with an inverter I was using inside the car. I removed the inverter and it was still happening after that. During that time, it was happening almost every day. It has not happened for a few weeks now but since the dealership never did anything, it might happen again who knows. I also heard the new Chrysler Pacifica has similar issues. If you research this problem on the internet, it seems to be a problem that has been there for a long time with Chrysler minivans and Chrysler never addressed it. 1000 mi Noise from front end during highway travel, dealer traced to bad seal. Needed to order parts. 3000 mi Front wheel bearing replaced. See our lemon odds and nada odds page to see vehicles with no repairs or vehicles with more than three repairs. 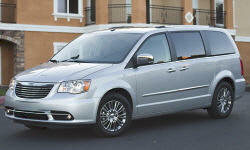 To see how frequently 2013 Chrysler Town & Country problems occur, check out our car reliability stats.